Lucile was the professional name of Lady Duff Gordon (1863-1935), one of the first British fashion designers to attain an international reputation. 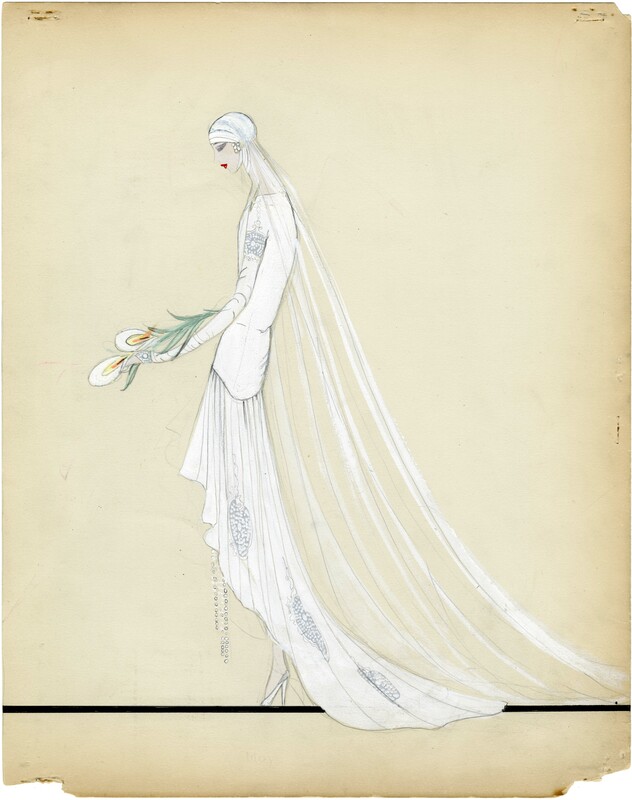 Rising to fame near the turn of the 20th century she opened branches of Lucile Ltd. in New York, Paris, and Chicago. She is frequently acknowledged as one of the first designers to train professional models and present live fashion shows. These events were invitational tea-time “mannequin parades” that employed theatrical lighting, music, souvenir gifts and programs. The dresses, which she called “gowns of emotion”, were listed in the programs using descriptive names like The Sighing Sound of Lips Unsatisfied or The Bleeding Heart. Lucile created complete ensembles accessorized with bags, shoes, and even parasols. She is best known for layered, draped garments departing from the restrictive corsetry and boned bodices common at the time. Her designs harmonized with the spirit of the new century of modernism and reform. The hallmarks of her design were colorful fabrics and generous trimming with sprays of hand-made flowers or ribbons, but she also added daring elements such as slit skirts and plunging necklines. A gown, she said must simply “express the wearer’s taste and individuality.” She dressed film and stage actresses and her celebrity clientele included Mary Pickford and Irene Castle. Lucile took advantage of opportunities for commercial endorsement, lending her name to advertising for shoes, perfume, and other luxury goods. She was the first to create a diffusion line, teaming with Sears Roebuck in 1916 to produce a mail order catalogue of ready to wear clothing. Lucile also wrote a weekly fashion column for the Hearst paper and monthly columns for Harper’s Bazaar and Good Housekeeping magazines. Lady Duff Gordon constructed Lucile as a cosmopolitan identity, created through clothing designs, and writings and endorsements as an arbiter of taste and style. Lucile Ltd. was a pioneer in the fields of public relations and lifestyle merchandising. Although these sketches were made after Lady Duff Gordon had relinquished control of Lucile Ltd. they still display her influence of elegant, modern design. 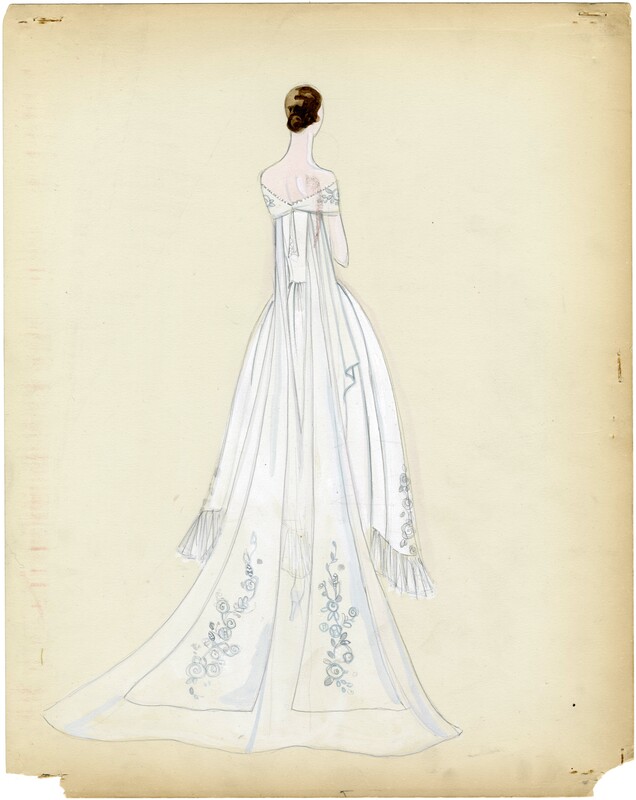 These digital prints are reproductions of original sketches of wedding dresses from the 1920s housed in the Lucile, Lady Duff Gordon collection in the Department of Special Collections and FIT Archives. The collection was arranged and described by Ashley O’Brien in the summer of 2010. It is comprised by approximately 11 linear feet of sketches, photographs, scrapbooks, and clippings. The Department of Special Collections is and FIT Archives acquires, preserves, and provides access to a wide range of primary research materials in their original formats, including archives, scrapbooks, oral histories, fashion sketches, illustrations, books, journals, and other items. Subjects include the apparel industry, fashion and regional costume, textile design and the textile industry, the FIT Archives, and, to a lesser extent, art, architecture and interior design. Department personnel are committed to supporting research by FIT students and faculty as well as designers and researchers from the apparel and textile field, other industry professionals, and scholars. 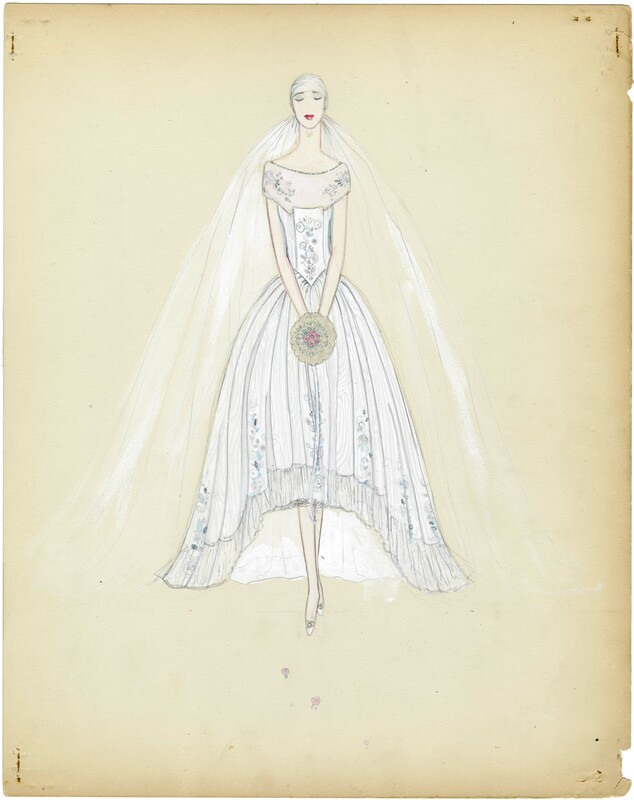 This entry was posted in Treasure of the Month and tagged Irene Castle, Lady Duff Gordon, Lucile, Mary Pickford, Sears Roebuck, Special Collections, wedding dress. Bookmark the permalink.